Protecting Pollinators: Why Should We Care About Pollinators? Protecting Pollinators: Why Should We Care About Pollinators? 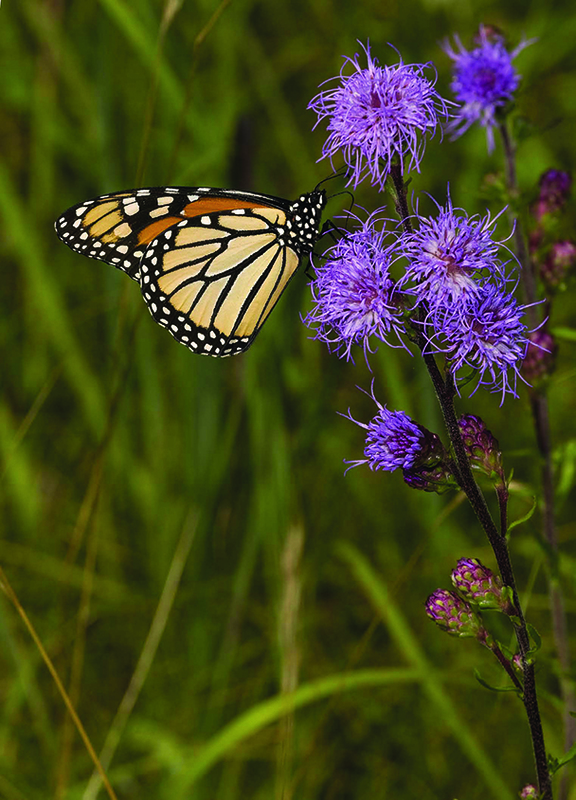 There are many different kinds of pollinator species (butterflies, bees, moths, and more), including this monarch butterfly (Danaus plexippus) on rough blazing star. Why Should We Care About Pollinators? Pollinators provide pollination services for wild plants and many of our crop species, too – one in three bites of food is due to cross-pollination by pollinators. Pollination is important for maintaining genetic diversity in plants and ensuring adequate fruit and seed production for crops, wildflowers, shrubs, and trees. Our forests, prairies, meadows, and gardens would look much different without the help of our pollinators. Pollinators are also important prey resources for other organisms such as migrating birds, beewolves, praying mantises, and many spiders, which in turn become food for other animals. Furthermore, as a very species-rich group, pollinators are an important component of our state’s biodiversity. Indiana’s pollinators include 430 species of bees, 144 species of butterflies, more than 2,000 species of moths, and many species of flower-visiting flies, wasps, ants, and beetles. Honey bees, one of the best-known pollinators, are actually not native to North America. About 2 percent of Indiana’s bee species are non-native. Unfortunately, Indiana’s pollinator communities face many threats. In the last 15 years, researchers have documented reduced populations of honey bees, bumble bees, and several butterfly and moth species. 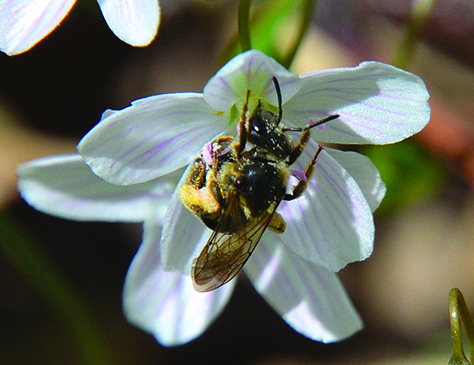 This publication provides information about how to establish and conserve effective pollinator habitats in Indiana — from small-scale backyard improvements to large-scale plantings. This publication explains some of the threats pollinators face. Other publications in this series describe steps you can take to protect pollinators. Figure 1. 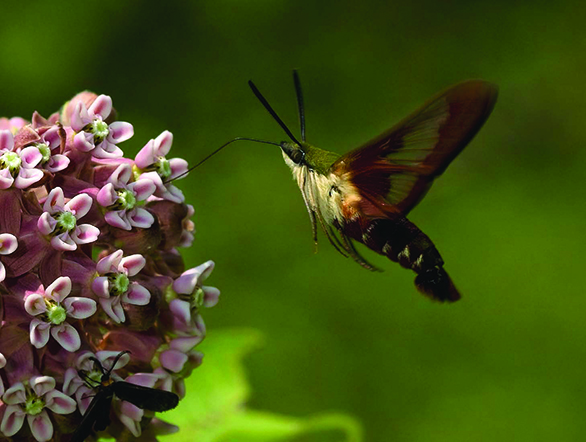 A hummingbird clearwing (Hemaris thysbe) on common milkweed. Pollinators face three major threats. Indiana was once almost entirely forested, but today only 20 percent of the state is forested. Development and agriculture are the main causes behind this loss of habitat. The problem is compounded by landscaping practices that rely on lawns and non-native plant species, and by the decrease in hedgerows on farm lands. In addition, invasive plant species out-compete native plants in many natural areas. The changing dynamics of our plant communities directly affect our pollinators. Many pesticide applications are meant to control harmful insects, but a pesticide’s effects extend to beneficial insects, including pollinators. For example, a class of insecticides called neonicotinoids are known to harm pollinators, but they are still widely used as treatments on commercial seeds. Neonicotinoid insecticides applied to seeds can be transferred to the nectar and pollen in certain plants. Many parasites and diseases attack honey bees, many bumble bees, and other native bees. Honey bee pests include Varroa mites, tracheal mites, American foul brood, European foul brood, African hive beetle, and twisted wing virus. Nosema bombii (a fungal pathogen) is known to attack bumble bees. People introduced many of these parasites to bee populations by moving commercial bees used for pollination around the world. Native bees are also susceptible to brood parasite insects such as cuckoo bees (fully one-quarter of all bee species in Indiana are cuckoo bees) as well as strepsipterans (beetle-like insects), meloid beetle larvae, velvet ants, and hoverfly larvae. Butterflies and moths are also very susceptible as larvae (caterpillars) to parasitic wasps, fungi, bacteria, and viruses. Native parasites are considered part of the normal ecology and diversity of the pollinator system, and normally play a minor role in reducing populations. Each one of these organisms threaten our pollinators. When combined, these threats interact to cause even worse effects. For instance, pesticides can significantly weaken our pollinators’ natural resistance to disease. Pollinators interact with plants in various ways and each species has a fascinating story. In many cases, a pollinator’s larva has a different story than the adult of the same species. Adult pollinators feed on the pollen or nectar in flowers. In the process, they carry some pollen to other flowers and pollinate them. Adult bees, butterflies, many wasps, moths, flies, beetles, and ruby-throated hummingbirds depend on nectar or pollen as their sole food source or as a supplemental or alternative food source. Adult bees also feed pollen to their larvae. They roll the pollen (often mixed with nectar) into a ball and lay their eggs on top, so that hatched larvae have a ready food source. Butterflies and many moths feed on plant foliage as larvae (caterpillars). Wasps often feed on nectar as a supplemental energy source. Flies exhibit a range of feeding relationships with plants. Some adult flies only visit flowers. Some fly larvae eat foliage, fruits, seeds, or decomposing material. Beetles are often seed predators as grubs or larvae, and as adults forage of pollen and nectar. While not very efficient at it, they can potentially pollinate flowers as part of their foraging. Hummingbirds mainly use nectar from flowers, but they also glean insects from the air as a protein source. In addition to these pollinator-plant interactions, pollinator species vary greatly in the number of different plant species they will use for food. There are two basic kinds of feeding patterns. Figure 2. 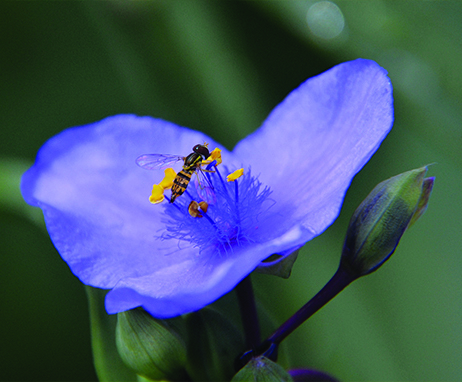 This photo shows a syrphid fly (Toxomerus germinatus) on Ohio spiderwort. Figure 3. 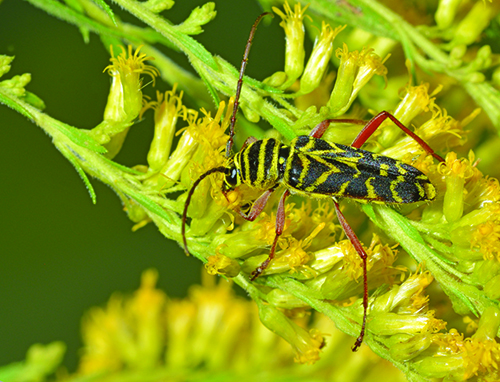 A locust borer (Megacyllee robiiae) foraging on goldenrod. Specialists only feed on one plant species or genus, either as adults collecting pollen and nectar, or as larvae feeding on foliage. For example, the spring bee (Andrena erigeniae) only uses pollen from spring beauties(Claytonia virginica) to provision its offspring. And monarch butterfly caterpillars will only feed from milkweed (Asclepias species) plants. Figure 4. The spring bee (Andrena erigeniae) feeds only on spring beauty. Generalists, on the other hand, feed off many plant species. For example, honey bees, bumble bees, and adult butterflies, moths, and wasps will often visit many different flower species to obtain nectar or pollen. The adult monarch butterfly is a generalist, and will feed on any available nectar source. Bees and other pollinators have different lifestyles: social, solitary, or parasitic. Although very few pollinators are social (that is, species in which a group of females work together to rear offspring), these are often the ones people think of when they hear the word “pollinator.” However, only honey bees, bumble bees, a subgroup of sweat bees, and several wasp species are truly social. Most other pollinators (including 70 percent of the bees in Indiana and most butterflies, moths, flies, and beetles) are solitary — that is, a single female provisions offspring. Some bees are parasites on other bees and are called cuckoo bees. These brood parasites generally act as cowbirds do in the bird world by tricking other bees to care for their offspring. Most nonsocial bees do not care for their offspring. They lay eggs and provide provisions and then the offspring is on its own. It is clear that pollinators are essential components of ecosystems. Whether in forest, prairie, black-oak savanna, a crop field, or your backyard, pollinators create many key linkages in food webs, and help keep ecosystems functioning properly. The intricacies of pollinator-environment interactions mean that we must take a broad approach to conserve pollinators. Cover photo and Figures 1 and 3 by Jeffrey Belth; Figures 4 and 3 by Martin Lucas. Reference in this publication to any specific commercial product, process, or service, or the use of any trade, firm, or corporation name is for general informational purposes only and does not constitute an endorsement, recommendation, or certification of any kind of Purdue Extension. Individuals using such products assume responsibility for their use in accordance with current directions of the manufacturer. This publication is supported by the Office of Indiana State Chemist Pollinator Protection Plan. More information about the plan is available on the State Chemists' website: www.oisc.purdue.edu/pesticide/p3_activities.html. This publication was partially funded by a Purdue Extension Issue-Based Action Team (IBAT) award.